UofL is not only committed to recycling, reuse, and composting, but more importantly minimizing waste in the first place. The University of Louisville is taking a variety of steps to reduce the amount of waste generated on campus and to divert a greater percentage of our waste from going to landfills. 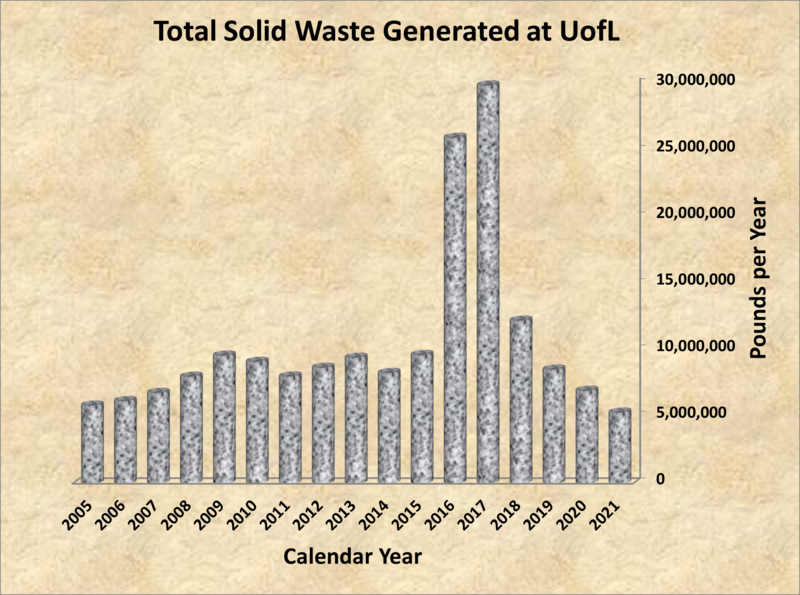 UofL had been making progress in our goal of reducing our total annual waste generation since a peak in 2009, but we need to step up our efforts to reduce the amount of solid waste produced on campus. While each year's total fluctuates with various factors such as major construction and renovation projects, we can see the need to tackle this problem through a multifaceted, university-wide approach. There is still much more we need to do in order to achieve our goal of Zero Waste. In 2017, we recycled over 23.2 million pounds (77.8%) of our waste, the majority of which came from numerous construction projects on campus. Our landfill diversion rate in 2017 without construction/demolition waste was 42.9%, and without coal ash was 81.1%. Recycling is a key principle, but true sustainability demands that it must always come AFTER efforts to significantly reduce waste generation in the first place and to reuse items whenever possible. UofL's landfill diversion programs include extensive recycling, reuse, composting, waste minimization, and other waste reduction efforts from the classroom to the construction site. In 2013, UofL reduced its total annual waste generation by over 886,000 pounds (a 10% reduction from 2012) and we recycled nearly 4.5 million pounds (57.4%) of our waste. UofL Trash Mob Flash Mob! The mini-bin is a reminder that we can recycle most everything at UofL! UofL students in GRASS (Group Recycling And Sustainable Solutions) have helped change the disposable culture on campus through awareness raising campaigns such as "dumpster dives." Custodial staff training, development of policies regarding waste disposal, performance review standards, etc. UofL's Solid Waste Reduction Committee is attempting to address these concerns and we'd love to have your input. This voluntary committee will report to the Sustainable Operations Committee. To get involved, contact: Greg Schetler at (502) 852-0926. Remember that the famous “Three Rs” are in order of priority: Reduce, Reuse…THEN Recycle! Learn why at The Story of Stuff. Go Paperless! Instead of printing, use electronic file-sharing like SharePoint or Blackboard. - Instructors: Get the mobile app for paperless exams! If you must print, use both sides! All UofL Uniprint Stations now automatically print double-sided! This switch alone reduced our paper consumption by about 30,000 pages per month! Keep your mistakes and second-thoughts digital! The Canon printers installed across campus in the fall of 2018 feature misprint-reduction technology. The “Print Anywhere” feature allows you to send a print job from your office or your mobile device, and pick it up at any new Canon device on campus. Your print jobs wait in your personal, secure print queue for 24 hours, and they only print out when you tell them to. This reduces paper waste caused by unintended or premature print jobs. Bring reusable shopping bags instead of accepting new paper or plastic bags. At mealtimes, use reusable items like mugs, cups, utensils, cloth napkins and towels rather than disposable products. If you're headed out, bring your own! Reusable Mug/Cup Program: Receive 10 cents off your next drink whenever you bring your own reusable mug or cup to the SAC Marketplace, Twisted Taco in Louisville Hall, the SRC Cafe, or to any Starbucks or P.O.D. location on campus! At McAlister's in MITC, you'll receive half-priced ($1 off) drinks when you fill up with your own reusable McAlister's cup. In 2015-16, UofL Dining piloted a new take-out service in truly sustainable style – without adding to the waste stream!! In Fall 2018, this reusable to-go container option was made permanent. For $20, anyone can buy into the program and they will receive a reusable tote bag, bottle, and to-go clam-shell container which they may use at The Ville Grill. Patrons simply return their container to The Ville Grill for washing and pick up a new one. Memberships in the program are available at The Ville Grill registers. Use reusable filters instead of disposable ones in your furnace, coffeemaker, etc. Use rechargeable batteries rather than disposables. Avoid unnecessary purchases and excess packaging. Buy in bulk. Save some money and the planet by first seeking used and pre-owned items before shopping for new. UofL departments can freely exchange durable items like furniture and equipment for reuse through UofL Surplus. 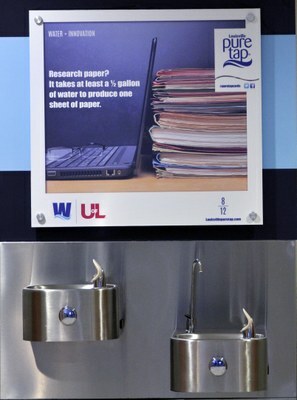 UofL and Louisville Water Company are working together to educate students, faculty and staff on the value of getting back to the tap on campus. 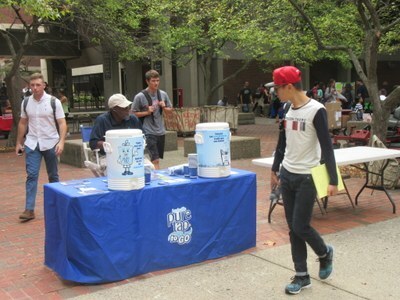 This partnership includes messaging at drinking water fountains, events and guest lectures. Louisville Water's story of science, engineering and public health brings a real-world example to the classroom. Louisville Water Co. will provide staff for guest lectures and tours of the water treatment facilities. Curious about how drinking water is made or the engineering behind it? Perhaps you'd like to explore the political and global issues around water or dive into the marketing of tap water. 2. SAC Renovation / Expansion - The project is adding 6 chilled water bottle filling stations, each with two drinking fountains adjacent. 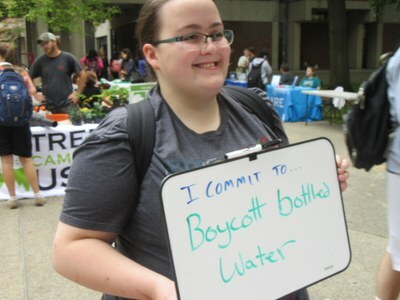 "Having conducted about 200 Tap Water Challenges on campus, I have found that about 88% of students prefer the taste of Louisville Tap to Aquafina (which is simply tap water from Indiana) or Kroger bottled water (tap water from Virginia)!" Chemical Waste Minimization - Before you purchase a chemical for your lab, check UofL's CHEMEX inventory. 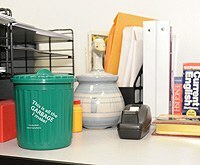 You could save yourself money, while doing your part to reduce waste and avoid costly disposal. IFIXIT - Don't trash it, FIX IT! The free repair guide for everything, written by everyone. DonorsResource.org - Don't trash it, donate it! Find a local nonprofit that needs the items you want to donate. Members of the UofL community are encouraged to seek creative ways to see that durable items are reused. This helps save money, reduces the amount of waste we send to the landfill, and reduces the environmental impact of producing and transporting new goods. UofL's surplus property exchange program allows staff and faculty to swap reusable departmental items such as furniture, equipment, electronics, and supplies. Surplus items no longer needed by the University may be donated to another state/governmental agency or non-religious non-profit organization. Unclaimed items are periodically auctioned to the public. UofL also donates unwanted building materials, furniture, and appliances to Louisville's Habitat for Humanity ReStores where they can get a new life while raising funds for affordable housing projects. In Fall 2013, students in Group Recycling And Sustainable Solutions (GRASS) joined forces with the UofL Sustainability Council and Campus Housing to open a permanent Free Storein the basement of Unitas Hall (enter from Cardinal Blvd near Brook Street). The UofL Free Store is a space for the on-going free exchange of clean, durable items like clothing, shoes, electronics, small appliances, household items, bath & beauty supplies, books, school & art supplies, non-perishable food, and more. Donations can be made any time in the red bins at the base of the driveway just east of Unitas, off Cardinal Blvd. In 2017 alone, the Free Store helped keep over 700 pounds of items out of the landfill! UofL promotes an inclusive environment for all, regardless of gender identity and/or gender expression. The Free Store is a Transgender-Friendly space. The store is run by volunteers and is open to all UofL students and employees set hours each week during the regular academic year. Volunteers wanted! Follow the Free Store on . Goodwill CANNOT accept any of the following items: Glass, Paint, Chemicals, Car batteries, Tires, Computers or computer components, or Televisions. 2018: 4,751 pounds of reusable goods to Goodwill! 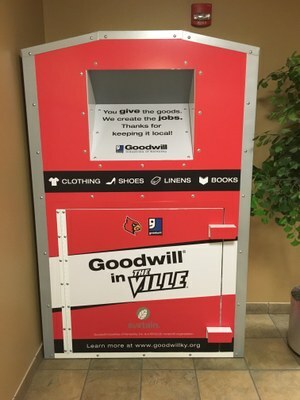 During Move-Out Time, UofL residents are also encouraged to donate and exchange reusable items through the "Lighten Your Load" (formerly "Give and Go") collections and associated Free Stuff Swap hosted at the end of the year by Campus Housing in partnership with Goodwill Industries of Kentucky. During UofL's 2018 Lighten Your Load Move-Out Waste Reduction campaign, students donated 4,751 pounds of reusable goods to Goodwill! (Down from 5,268 pounds in 2017.) Look for signs and collection bins in residence hall lobbies as you think about moving out! 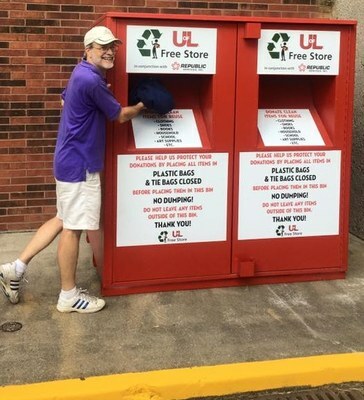 Prior to the opening of the UofL Free Store, roughly 2000 pounds/year of used clothes and shoes were collected from 2012-14 in light green bins set up by a non-profit organization at Miller Hall, Threlkeld Hall, Kurz Hall, Unitas Hall, and University Tower Apartments. The Gaia Movement is a non-profit organization which uses revenue from used clothing to support and on‐going environmental and community development projects around the world. Clothes collected at UofL helped fund efforts including a solar power project in Quissanga District in Mozambique; a biogas project in Capo Delgado Province, Mozambique; a solar power project in Changalane District, Mozambique; and the Seeds for Life project in India. Clean Styrofoam coolers used in shipping can be reused! For on-campus reuse, contact Cathy Price (Dept. of Environmental Health & Safety) at 502-852-2956. Also, the local non-profit Supplies Overseas can use such coolers (and other things like saline bags) for shipping medical supplies to needy communities. They welcome both one-time and regular donations of surplus medical supplies and equipment from all individuals, hospitals, medical clinics, and other health care organizations throughout the region. They accept drop-offs at their warehouse (1500 Arlington Ave.) 8am-4pm, Monday-Friday. 502-736-6360. From cans to magazines to batteries to computers...learn about the wide array of items that can be recycled at UofL here. - Horticulture Zone garden behind the Urban Studies Institute at 426 W. Bloom St. (behind Bettie Johnson Hall). No meat, bones, or dairy products are accepted in any of these on-site composting bins. This helps reduce problems with odors and vermin. UofL has been turning about 500,000 pounds of campus grounds waste into valuable compost and mulch on site for many years. UofL's research facilities also generate about 400 tons/year of waste animal bedding. This used to be sent to the landfill, but in February 2012, UofL began sending this waste stream to off-site composting facilities, where it is turned into an environmentally-responsible soil amendment. In July 2010, UofL volunteers began on-site composting of pre-consumer plant-based food waste from our dining facility kitchens. This effort continues to capture various waste streams, but in March 2012, UofL established a new contract for collection and twice-weekly pick-up of all food wastes from UofL dining facilities as well as our Early Learning Campus. This allows us to compost both pre- and post-consumer food wastes, meats, bones, and dairy-products, now totaling over 400,000 pounds/year. This contract is currently managed by WestRock Recycling. 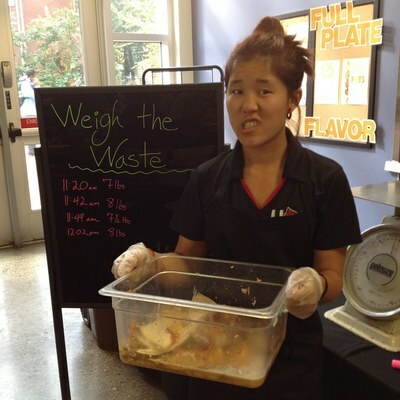 UofL Dining hosts an annual a Weigh The Waste campaign to raise awareness during the fall UofL Sustainability Week. Food scraps are collected from patron's plates during a full lunch period at The Ville Grill. Total weights are gathered each year and shared to increase awareness about food waste. - In Spring 2017, UofL Dining began monthly Weigh The Waste events to raise awareness over the lunch period: February 16th, March 23rd, and April 20th. - In 2016, Weigh The Waste was expanded to two consecutive days. We collected: 94 lbs. on October 17th, and 103 lbs. on October 18th. - In 2013, 230 lbs. of food waste was collected for composting during one lunch period on Oct. 24th (with 507 guests = 0.45 lbs of waste per person). - In 2012, 159 lbs. of food waste was collected for composting during one lunch period on Oct. 24th (with 466 guests = 0.34 lbs of waste per person). Full details about all of our Composting Programs here.